Composable Nomination Classic Gold Daily Life @ Charm, a stainless steel base link with 18ct Gold. Composable Nomination Classic Gold Daily Life & Charm, a stainless steel base link with 18ct Gold. Composable Nomination Classic Gold Daily Life Big Scissors, a stainless steel base link with 18ct Gold. 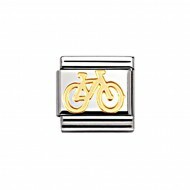 Composable Nomination Classic Gold Daily Life Bike Charm, a stainless steel base link with 18ct Gold. Composable Nomination Classic Gold Daily Life Bone Charm, a stainless steel base link with 18ct Gold. Composable Nomination Classic Gold Daily Life Book Charm, a stainless steel base link with 18ct Gold. Composable Nomination Classic Gold Daily Life Boy Charm, a stainless steel base link with 18ct Gold. Composable Nomination Classic Gold Daily Life Camera Charm, a stainless steel base link with 18ct Gold. Composable Nomination Classic Gold Daily Life Car Charm, a stainless steel base link with 18ct Gold. Composable Nomination Classic Gold Daily Life Cell Mobile Phone Charm, a stainless steel base link with 18ct Gold. Composable Nomination Classic Gold Daily Life Children Charm, a stainless steel base link with 18ct Gold. Composable Nomination Classic Gold Daily Life Coffee Pot Charm, a stainless steel base link with 18ct Gold. ComposableNomination Classic Gold Daily Life Cup Charm, a stainless steel base link with 18ct Gold. Composable Nomination Classic Gold Daily Life Dice Charm, a stainless steel base link with 18ct Gold. Composable Nomination Classic Gold Daily Life Dummy Baby Pacifier Charm, a stainless steel base link with 18ct Gold. Composable Nomination Classic Gold Daily Life Shopping Bag Charm, a stainless steel base link with 18ct Gold. Composable Nomination Classic Gold Daily Life High Heel Shoe Charm, a stainless steel base link with 18ct Gold. Composable Nomination Classic Gold Daily Life Key Charm, a stainless steel base link with 18ct Gold. Composable Nomination Classic Gold Daily Life Lily Charm, a stainless steel base link with 18ct Gold. Composable Nomination Classic Gold Daily Life Little Scissors Charm, a stainless steel base link with 18ct Gold. 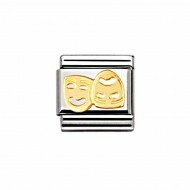 Composable Nomination Classic Gold Daily Life Masks Charm, a stainless steel base link with 18ct Gold. Composable Nomination Classic Gold Daily Life Moon Charm, a stainless steel base link with 18ct Gold. Composable Nomination Classic Gold Daily Life Padlock Charm, a stainless steel base link with 18ct Gold. Composable Nomination Classic Gold Daily Life Point Charm, a stainless steel base link with 18ct Gold. Composable Nomination Classic Gold Daily Life Raised Point Charm, a stainless steel base link with 18ct Gold. Composable Nomination Classic Gold Daily Life Raised Star Charm, a stainless steel base link with 18ct Gold. 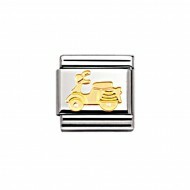 Composable Nomination Classic Gold Daily Life Scooter Charm, a stainless steel base link with 18ct Gold. Composable Nomination Classic Gold Daily Life Screw Charm, a stainless steel base link with 18ct Gold. Composable Nomination Classic Gold Daily Life Shooting Star Charm, a stainless steel base link with 18ct Gold. Composable Nomination Classic Gold Daily Life Smile Charm, a stainless steel base link with 18ct Gold. Composable Nomination Classic Gold Daily Life Snowflake Charm, a stainless steel base link with 18ct Gold. Composable Nomination Classic Gold Daily Life Star Charm, a stainless steel base link with 18ct Gold. Composable Nomination Classic Gold Daily Life Stethoscope Charm, a stainless steel base link with 18ct Gold. Composable Nomination Classic Gold Daily Life Sun Charm, a stainless steel base link with 18ct Gold. Composable Nomination Classic Gold Daily Life Telephone Charm, a stainless steel base link with 18ct Gold. Composable Nomination Classic Gold Daily Life Wedding Rings Charm, a stainless steel base link with 18ct Gold.